I bought a Larin floor jack to replace my car’s missing-in-action scissor jack for an upcoming road trip. The model I purchased was the Larin LJJS-2, which is available on Amazon, and comes with a jack and stands. I thought I would do a short review on it. The Larin hydraulic jack has a lifting range of 5 1/8 to 13 inches and has a 2-ton capacity, which is 4,000 lbs. It came with jack stands rated at the same capacity. Because the jack will be placed in the trunk, size and weight were important considerations for me. The jack, with its detachable handle, is light enough (and small enough) to pack in and lift out of the trunk with ease. I may keep one stand in there for the trip because it is fairly small, too. Before using it, I checked the bolts and hardware to make sure everything was snugged tight and not broken. All was good. Also, I followed Larin’s instructions to purge any air in the hydraulic system, which could impact lifting performance. All checks done, I tested the jack in the garage with my 3,600 pound car. I lifted each wheel individually, then put a stand under the car. This is the type of lifting I may need to do on the road, so it was what I simulated with the jack. Note: I did not lift from the center of the vehicle, which would allow two wheels to be lifted at once. I have no idea how this unit would perform in that capacity. I use another jack for that purpose. The hydraulic lifting action could be a little smoother and faster. The speed reminds of a small bottle jack. The release valve allowed for a gradual descent when turned counter-clockwise. But for the price and my intended purpose, it does the job just fine. The floor jack seemed stable with the lifting range I’ll use to get one tire off the ground and a stand under the car’s subframe. For a quick roadside tire repair, I think it will work fine for my purposes. The jack would work well for those who occasionally lift their vehicles and are on a budget. It is far cheaper than a good aluminum floor jack. 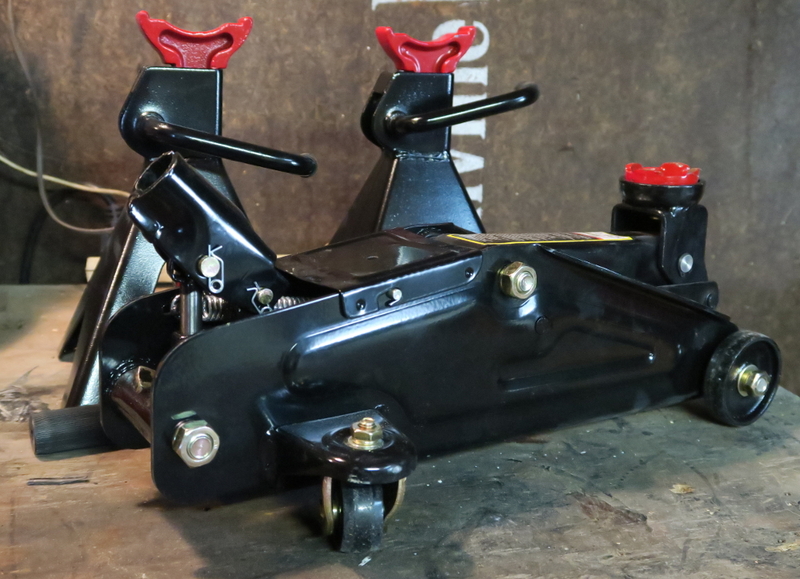 The Larin unit is similar to many floor jacks on the market. The colors may be different on the other jacks, but the design and specs are similar. I have no issues with this unit. After my initial test, I used it a few more times to lift my car and work on its brakes. This jack is not a high-dollar unit, but it serves the budget market and fulfills my purpose. Can’t beat that. Buy the Larin floor jack on Amazon.